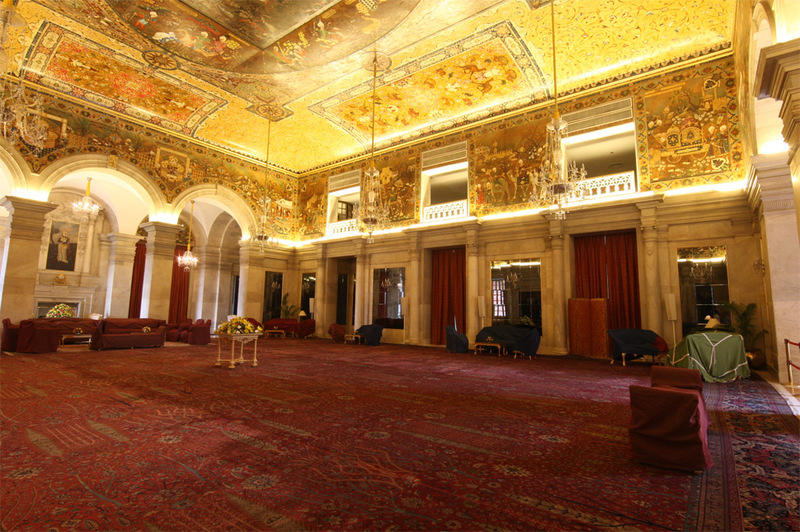 One of the most fascinating and ornately decorated rooms of Rashtrapati Bhavan is the Ashok Hall. Interestingly, this huge artistically done up space that is now used for important ceremonial functions, was erstwhile used as the State Ballroom. 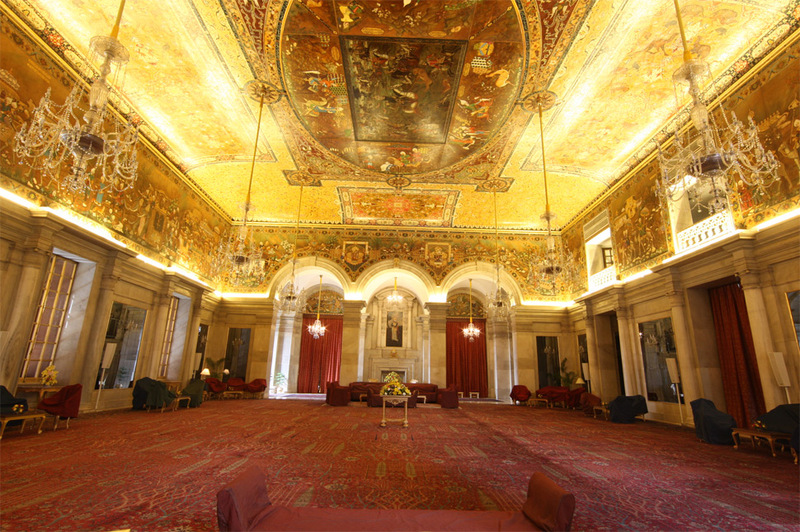 The Ashok Hall is used for presentation of credentials by Heads of Missions of foreign countries and as a formal place of introductions for the visiting and Indian delegations prior to the commencement of the State Banquets hosted by the President. The ceiling and the flooring of this room both have a charm of their own. While the floor is totally wooden and has springs beneath its surface, the ceilings of Ashok Hall are decorated with oil paintings. The centre of the ceiling has a leather painting showing an equestrian portrait of Fath Ali Shah, the second of seven Qajar rulers of Persia, hunting a tiger in the presence of his twenty two sons. This painting, which is measured at 5.20 metres in length and 3.56 metres in breadth, was gifted to George IV of England by Fath Shah himself. During Lord Irwin's tenure, this gifted piece of art was brought from London’s India Office Library and affixed on the ceiling of the State Ballroom, as it was then known. One might call it an optical illusion, 3 D effect or just the excellence of the painter, but when one sees the eyes of Fath Ali Shah in the painting from any corner of the Room, he appears to be focusing on the viewer only. It is believed that Lady Willingdon did not appreciate the painting to be put in isolation and hence called for Italian artist, Tomasso Colonnello. With the help of twelve Indian artists, Colonnello extended the central forest theme on the rest of the surface. Four more hunting scenes along with inscriptions in Persian were added to beautify the Ashok Hall’s ceiling. The walls of the hall portray a royal procession and while the ceilings were painted directly, the walls were done on huge hung canvasses. Painting the entire walls and ceilings was started in June 1932 and was completed in October 1933. Colonnello has signed the fresco at one odd place in the Ashok Hall. It will be an interesting activity for the visitors to spot his signature! With the glow of six Belgium glass chandeliers, the Hall does not fail to fascinate its visitors. A loft was also designed in the State Ballroom as a space for the orchestra, however, it is now used for playing the national anthem during important functions. The three vestibules, on the other hand, are a source of ventilation, providing fresh air to pass this hall while the French windows of the Ashok Hall give a splendid view of the Mughal Gardens. The walls and pillars are done in pale grey marble which contrasts well with the rich work done on the floors and ceilings. Other highlighting features of this Jewel Box are the paintings of Persian poet, Nizami and of a Persian Lady. These are placed behind the southern and northern arches of the Ashok Hall respectively. 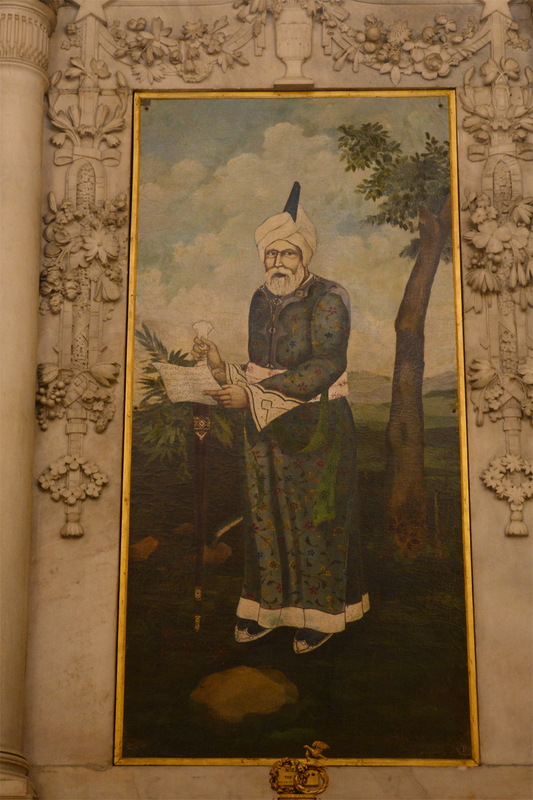 NIZAMI: The oil on canvas painting depicts 12th century Persian Poet, Nizami Ganjavi, whose full name was Jamal ad-Din Abu Muhammad Ilyas ibn-Yusuf ibn-Zakki. An admired romantic epic poet of Persian literature, Nizami brought an informal style of writing to the Persian epics. His work is widely regarded in Central Asian regions of Afghanistan, Iran and Tajikistan. THE PERSIAN LADY: The oil on canvas painting of the Persian Lady is represented by a female dressed in Persian attire. Holding a vessel in her hand, the Persian lady is adorned by an ornate crown. The painters of both these paintings are unknown. 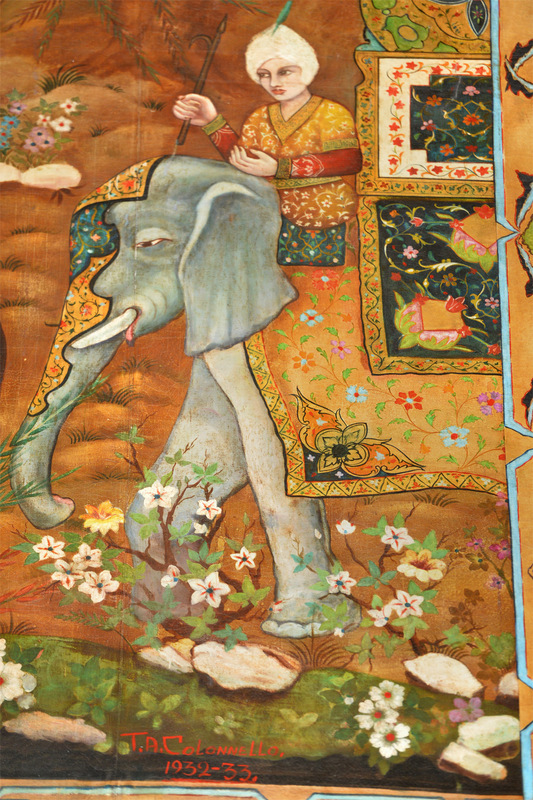 Remarkable art pieces form a part of the Ashok Hall. It includes a long case clock that was made in England and has a marking of British Clock Enfield by Cooke & Kelvey Ltd, Calcutta. The Persian styled carpet measuring 32 metres by 20 metres was designed especially for the Ashok Hall keeping in mind its grandeur. It is said that, “Lutyens was especially anxious that the weaving of the carpets for Government House should revive the standard of design and technique of the great Persian period.” Furthermore, it was noted by Christopher Hussey that, “…for the other State Rooms, sixteenth and seventeenth century Persian originals were loaned so that not only the patterns but the dyes and materials should be reproduced and so revive standards of the age of Shah Abbas.” The carpets were said to have engaged five hundred weavers for two years. 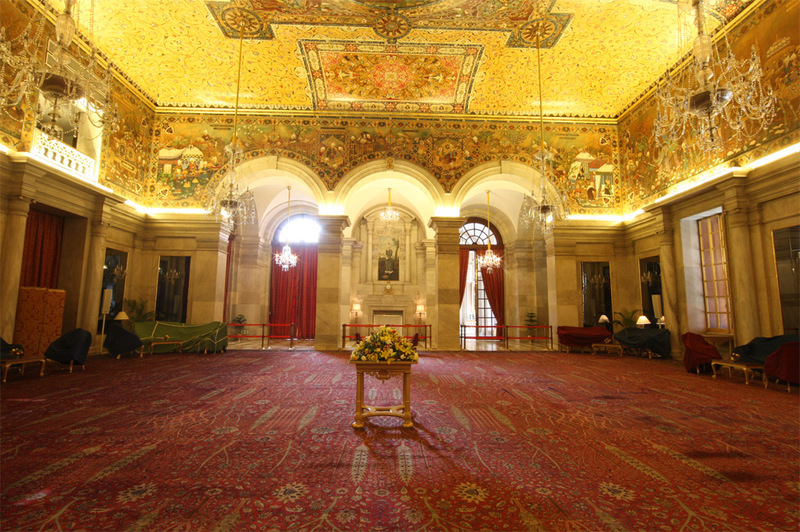 The carpets of the Ashok Hall, deep red in colour, have detailed floral and vegetal motifs done all over it and have been preserved well even after being in use for over eight decades.